Note: this photo was published to illustrate the Verizon Building (i.e., the one in the background) on the 42nd Street section of a blog page titled "New York Songlines: 6th Avenue." It was also published in a May 27, 2010 blog titled "Parks Lure in Women, so the Men Will Follow." And it was published in a Sep 15, 2010 blog with the bizarre title of "A gas station is a place where you sometimes fill the car, but more often drain the kids” ~ Happy FRISKY Friday ~." 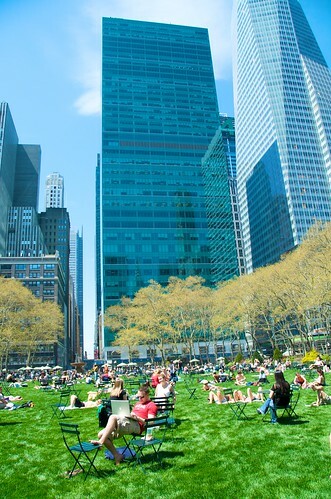 Moving into 2013, the photo was published in an Apr 1, 2013 blog titled "America's Greenest Cities."